Former factory Yamaha and Suzuki rider David Vuillemin offers up his take on the Houston Supercross. My head isn’t in writing this column today. I’ve lost my last grandparent yesterday. My Grandma was 89 years old and I am trying to book my travel arrangements to make to the funeral. I was dreading this day to happen. It’s always tough to lose a grandmother. They are always great to us and I have nothing but great memories with all of them. But anyways, the Houston SX had its good amount of drama once again and I’ve enjoyed watching it on TV. The track looked ok with its usual great dirt. I like that they had a tough rhythm section that made the difference but they still had that tight flat turn after the whoops that was one lined. The curve before the triple also made the track really narrow and made the riders come to the triple sideways, which isn’t ideal. Ask Windham on this one (more on that later). The track had a few 90-degree turns, which I am not a fan of for racing but I did love the huge bowl turn before the finish. Talking about that, what about RV railing it with both feet on the pegs? That was awesome. In the Lites, despite the Barcia-Vincent incident that everyone already covered, which I thought was an unfortunate racing incident, Barcia was again on top of his game. He had everyone covered and only had to deal with one block pass from Ken Roczen in the heat race. Ken rode more aggressive against Barcia but his speed and consistency in the rhythm section and the whoops was not good enough to battle with Barcia. Justin should and will clinch his second Lites SX title in a couple of weeks in New Orleans and I really hope to see him on the Canard/Seely/Hahn factory CRF450 for Seattle and Salt Lake. 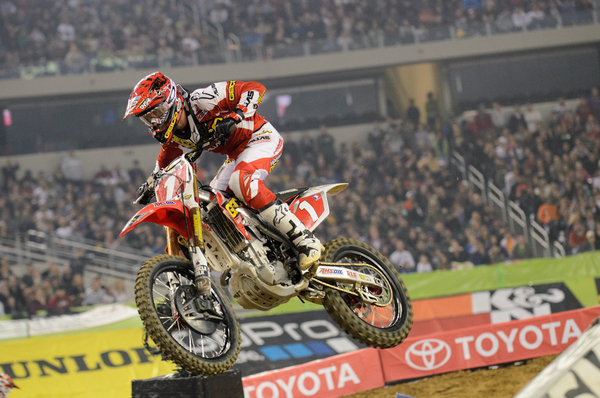 Will Hahn should go back to the Lites on the West, he’s not at 100% yet. Barcia’s on another level right now despite his Houston blast off. Despite a couple holeshots in Toronto, Will isn’t ready, as far as today, for the big class. With a thinner 450 field and RV already champion, the addition of the new Beast from the East would bring some entertainment in a class that is becoming more and more a snoozer (especially with KW out for the rest of the season). Think about it, Barcia, the best Lites guy going against the best 450 guy without any pressure of championship points. This could be exactly what we, the fans, need!! 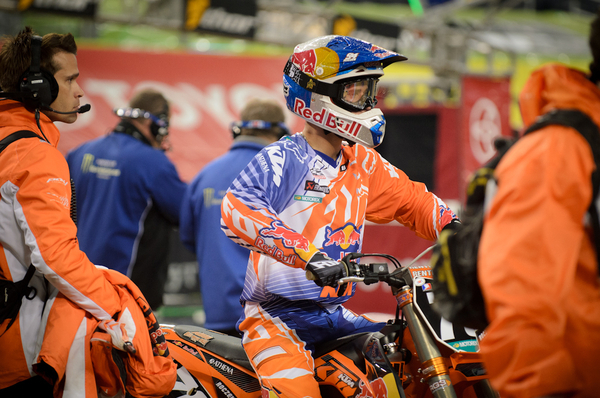 Roczen finally got his first win of the season, thanks to KTM’s Lance Vincent (conspiracy? j/k). Like I wrote in a previous column, it’s what it’s gonna take to beat Barcia, some advantageous circumstances. Good job on Ken for staying close enough to Justin in the main to take advantage of it. If he was 3 seconds farther from Barcia when the incident took place, Ken wouldn’t have won. Wharton keeps being consistent and got 4th in his home state after a nasty crash in the heat race. Big shout out to Eleven-10 Mods team and riders, Phil Nicoletti and Alex Martin, for getting 5th and 6th. Good bunch of guys in this true privateer team with limited funds. Martin has been improving tremendously in SX lately and even rode great in Toronto last weekend. Keep it up guys. Ken Roczen got his first win of the year and impressed DV. 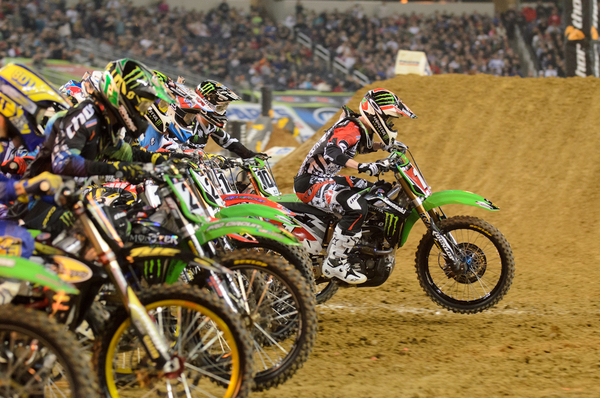 The 450 class started on a bang in Houston. Kevin Windham, 34, topped both timed practice sessions in front of the best rider in the world and the former fastest rider on the planet. What about the incredible heat battle between Stewart and Windham? James looked a little out of sync and Kevin was on fire. That race reminded me a little bit of Jacksonville 2009 with Reed and Stewart. They passed each other back and forth a few times and Windham gave us a technical riding lesson out there. Then, came his big and nasty crash. He dragged his foot scrubbing the triple. This stuff happens all the time nowadays. Remember RV crashing the same way (or was it RD?) at the Steel City National. KW is tall, has big feet and the way they made the curve before the triple are reasons those types of crashes happen. I am really impressed by Kevin and he is the one that stepped up the most in the last couple of races, in my opinion. Brayton did too but not to KW’s extend just yet. The other heat race by RV was amazing too. I think that’s the best he’s rode so far this year. Everything he did in this heat race was great, corner speed, jumping then skimming the whoops, over jumping at places to gain time. I really enjoyed his ride. RV’s main was a “walk in the park”. He holeshoted and told everyone “see you at the podium”. He was almost a second faster on the fastest lap than Millsaps and Weimer, in 2nd and 3rd. RV can now enjoy a weekend off filled with some outdoor testing and a well deserved SX title. You gotta to take your hat off to this guy for his dedication, his program, his entourage, his priorities and his ambitions. Ryan has one priority is to win on a dirt bike without any distraction. Ryan has been in the same team, on the same bike and had invested time and money to build his great winning program that could be a example for a lot (most?) of the guys out there. It’s not only wanting to win but doing what it takes and make the right decisions to actually do it. Some of the riders are struggling, had a bright future, had huge potential (maybe more than Ryan), amazing amateur careers but failed to find all the right pieces of the puzzle. Davi Millsaps got his 3rd podium in his last 4 races. You can’t blame him to be a little off RV’s pace and he rode a solid race. He made some great thing technically on the track. The one that comes to my mind is that little triple-single after the start and before the fist whoops section. It looked like it was tough to downside the triple. Davi would “case” the triple on purpose which would make him bounce over the 4th and last jump before the whoops. That move was a great set up to the whoops section and definitely my favorite of the day! Jake Weimer was back on the podium and he rode the way we were accustomed to see him ride in the beginning of the season. He had a pretty mellow main and only had to pass Alessi and Kiniry to get on the podium. Good to see him back up there after a rough month. This is all anyone saw of RV this year. Mike Alessi had a good race. Had to go to the LCQ to transfer into the main after a pile up in the heat race. He went ahead to win the LCQ and he pulled a great start from way outside. He was 4th after a couple turns, passed Kiniry who was 3rd for a bit and a lap later Weimer passed him. I didn’t see him jump the 3-3 on the table in the rhythm section when they were filming him and I would have thought he would lose time and position by not doing it. On the contrary, he rode a consistent race and stayed where he finished the whole moto. He was 6th fastest in the main and “only” 19 seconds from the winner, which is closer that it’s been lately. Shout out fill-in rider Kiniry for putting his YZF450 in 6th place. Can you guys believe it? A fill in rider on a Yamaha beating a factory Suzuki rider, a factory Honda Rider, a Pro Circuit Kawasaki rider with Showa Air Forks? It’s not possible with this bike, it had to be a different bike with blue plastics! (Sarcasm alert!) Congrats Bobby! Another shot out to Weston Peick, another fill in on a Yamaha, and his second 9th place finish of the year. A word on James Stewart and another DNF… Just scroll back up to the paragraph where I talk about RV’s program and don’t start talking about the bike! If Kiniry can get a 6th and Peick a 9th, Bubba can’t get on the podium and battle for a win once in a while?